A BELAY PARTNER IS NECESSARY IF YOU WANT TO ROPE CLIMB. BUT HOW DO YOU FIND ONE? You’ve recently signed up for a membership and need to find someone who will tie in with you. Your crew prefers to boulder but you’re ready to get on some ropes and nobody wants to join you. Perhaps your regular gym buddy finally finished her van conversion and is off to travel the country, putting your belaytionship on indefinite hiatus. Whatever the scenario, one thing remains the same: You need a belay partner. And while starting from scratch can be a challenging and potentially awkward endeavor, there are things you can do to simplify the process. First and foremost, let the front desk staff know that you’re looking for a partner and they’ll get on the PA system to make an announcement, says Mesa Rim Front Desk Supervisor, Matt Gordon. He adds that the front desk staff also make great resources because they essentially manage the gym’s hub. If you’ve never used Meetup.com, it’s an online forum that connects people who have similar interests. The site is a good option for climbers looking to make new friends and belay partners. Meeting new people can be uncomfortable, however Meetup acts a bit like an ice-breaker because you’ve already “met” people from the group and you know who to look for when you head into the gym. As a new member of Mesa Rim (and most climbing gyms), it’s required to obtain a certification in order to belay another person. This provides another opportunity to meet other people, says Dimmick; new climbers regularly complete lessons to get up to speed on belay technique. There are also a variety of climbing instruction classes that can help improve climbing technique and widen your climber circle. Many gyms—including Mesa Rim—have a community board where people post about local events, items for sale, and interest in finding a belay partner. This might be a bit of an ask for the introverted types, but the bouldering area is full of solo climbers who may be interested in top roping. Mesa Rim Mission Valley Site Manager, Hunter Moffitt, also suggests looking around the tall walls for potential climbing partners. 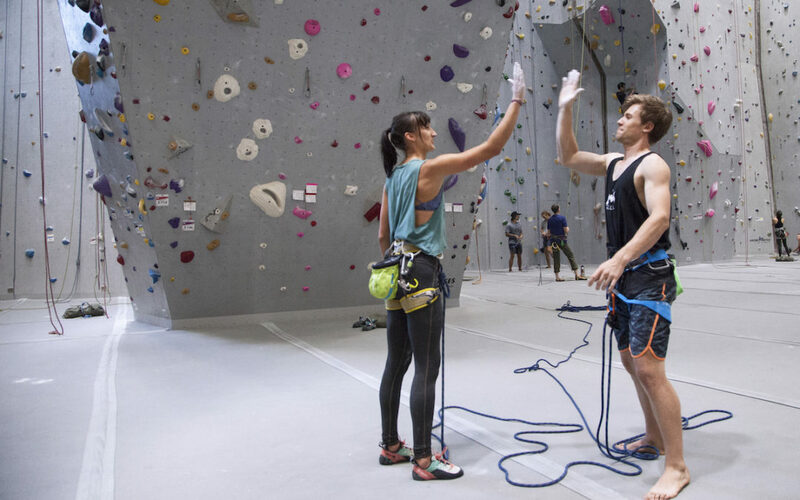 Finding a belay partner will require some proactivity on your part, but the rewards for reaching out to others can get you on the ropes with a new friend in no time.